Work is continuing on a project in downtown Toronto to recognize residential school survivors with a public space and sculpture at Nathan Phillips Square. Work is continuing on a project in downtown Toronto to recognize residential school survivors. The Indian Residential School Survivor Legacy project, a collaboration between Toronto Council Fire Native Cultural Centre, the Province of Ontario and the City of Toronto, will consist of an Indigenous healing garden at Nathan Phillips Square outside Toronto City Hall centred around a sculpture. The province is contributing $1.5 million and the city, $500,000. The overall cost is expected to be around $5.2 million, with the remainder being fundraised. Chief Ava Hill of Six Nations of the Grand River and Deputy Grand Chief Gord Peters of the Association of Iroquois and Allied Indians will facilitate an event Thursday at the Ontario Place Cinesphere offering an update on the progress of the project and the sculpture. "I really encourage people to to pay attention to it because it's going to be a commemoration of the residential school survivors now that we're in this era of reconciliation," said Hill. The garden and sculpture are in response to the Truth and Reconciliation Commission's Call to Action 82, which calls for governments to commission public structures in the provincial and territorial capitals to honour residential school survivors and those children lost to the residential school system. 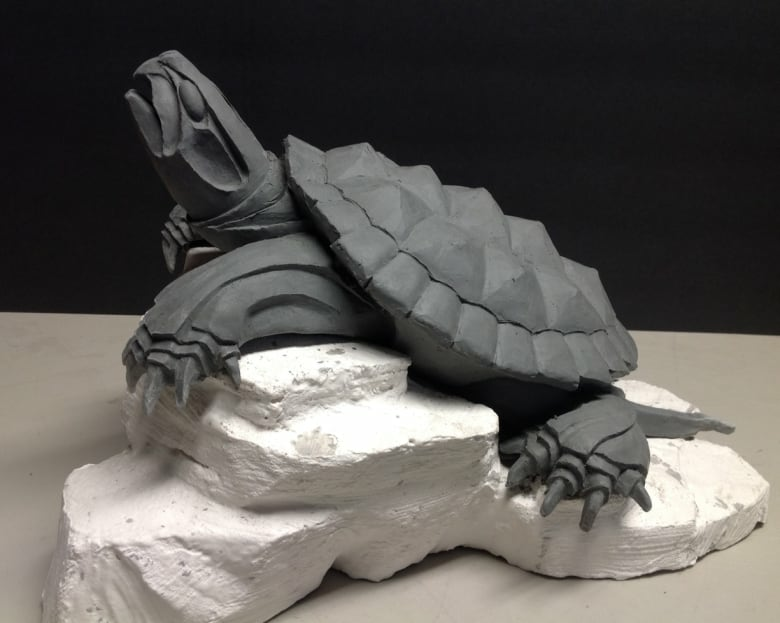 Designed by Anishinaabe artist Solomon King, the sculpture will be a giant turtle climbing over a boulder, representing the struggles experienced by residential school survivors and their continued resilience. The tiles on the back of the turtle will represent the different nations and clans within the province. The sculpture is also a reflection of the Turtle Island creation story. "The turtle takes us back to our lands," said Peters. "It's really important to know where to ground our identities." Titled Restoring Our Identity, the sculpture will be the centrepiece of the space that will be located at the southwest corner of Nathan Phillips Square. For nearly 20 years, Toronto Council Fire has been offering support and services to survivors of the residential school system. "Council Fire's IRSS legacy project is a powerful and thoughtful response to the Truth and Reconciliation Commission of Canada's call to action for each capital city to establish a highly-visible, accessible structure to commemorate the victims and survivors of the residential school system," said Toronto City Councillor Kristyn Wong-Tam. Having the Indigenous healing space and statue in a public space outside of City Hall will offer an opportunity for Indigenous and non-Indigenous people to learn about the history represented through the project. "I'm so happy that the city is taking such an interest in reconciliation," said Hill. "Once it's done, I think it's going to be an excellent display for people to learn more about who we are as a people." The project is set to be complete in the fall with the Restoration of Identity sculpture unveiling set for October.